Before you cringe at the fact that I used avocado’s to make chocolate pudding, let’s talk about how incredibly cute this kiddie treat looks! 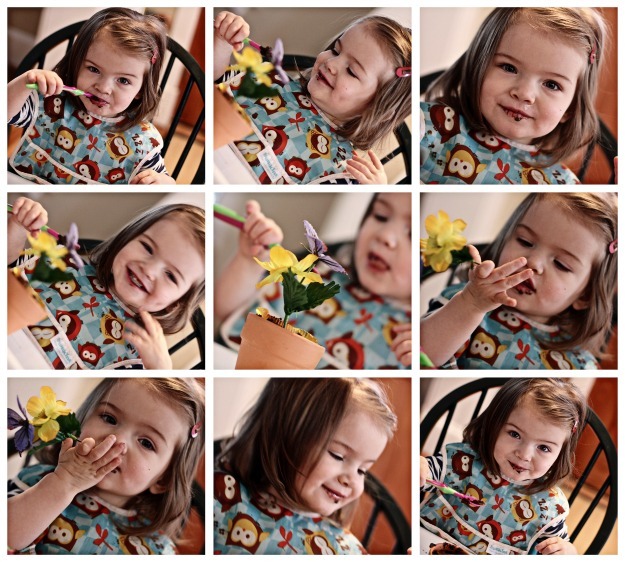 We had these flower pot desserts on special occasions when we were little. I remember the first time I saw one of these. I seriously thought it was dirt in a pot. After one taste I was sold! I decided to recreate this blast from the past for M, but with a few changes. 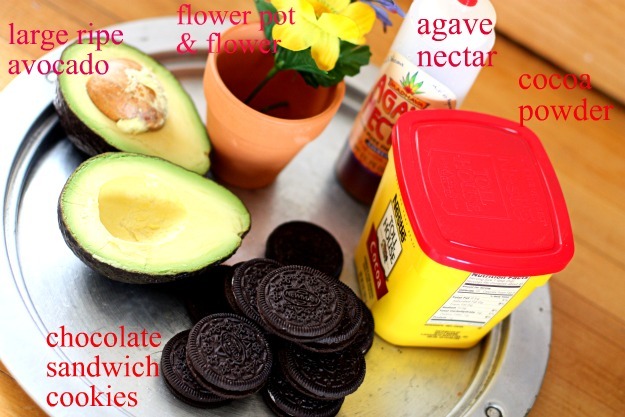 Before you make the chocolate avocado pudding, you want to crush the cookies. Once the pudding is how you like it, its time to layer the pot. Since there’s a hole on the bottom of the pot, I placed a whole sandwich cookie on the bottom to serve as a stopper. Next you add a few tablespoons of pudding. Then layer with a few tablespoons of crushed cookies, then more pudding, and finally a nice thick layer of crushed cookies. Once the pot is layered it’s time to dress it up. 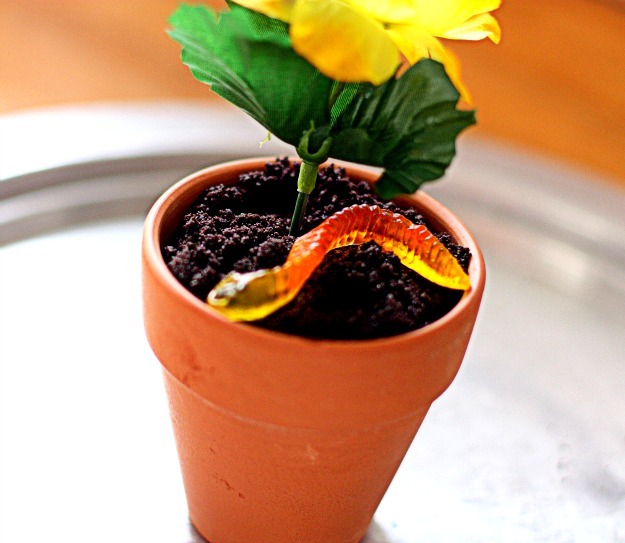 I topped it with a cute flower I found at Michael’s and gummy worm to add to the ‘dirt appeal’. 1/3 cup agave nectar (more or less to taste) – you can use honey too. Rinse out the flower pot before use. Let dry. Crush the cookies into crumbs using either a food processor or blender. Set aside. For the pudding, chop up the avocado and place in food processor or blender. Add cocoa powder, vanilla, & salt. Blend until creamy. 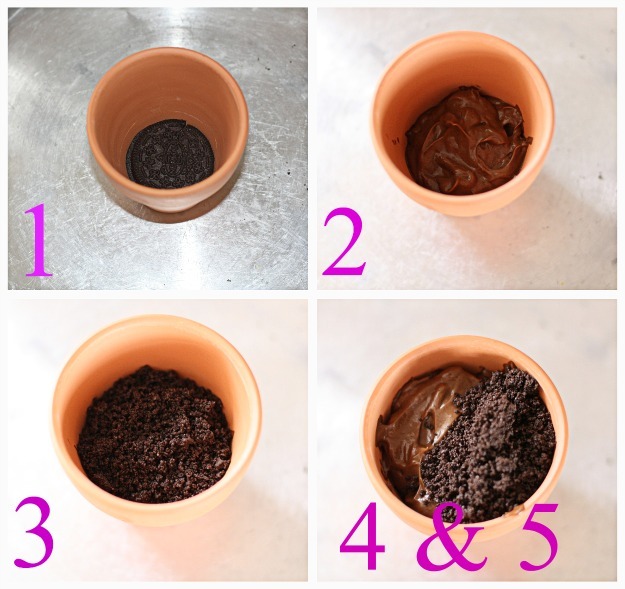 Be sure to scrape down the sides to ensure all cocoa powder is blended in. Slowly drizzle in agave nectar. Start out with 1 tablespoon and slowly add in more depending on the sweetness factor you like. If the pudding is too thick for you, add in a tablespoon or more of water or milk until the pudding is thin enough for you. To layer the pot, place a whole sandwich cookie on the bottom of the pot to plug the bottom. Layer with 3 tablespoons pudding, then 3 tablespoons crushed cookies, then pudding, and then the final layer of crushed cookies. 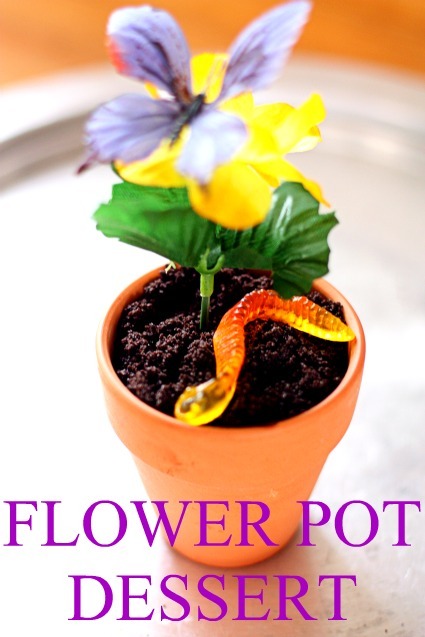 Stick the fake flower into the pot and top with a gummy worm 🙂 Serve immediately or refrigerate until ready to serve. This would make the perfect party treat!! Somebody was VERY happy when they saw this upon waking from their nap. She was smiling & giggling the entire time. These are adorable. I know they’re for kids, but I can’t think of anyone who wouldn’t love these ate any age. Oh my goodness this is adorable!!!!!! What a cute idea! I would have been just as happy as her to get this! Adorable! Oh, and M’s hair is getting so long! It’s funny seeing her grow up on here. I bet you’re going to love looking back to your blog when she’s older. These are so cute, they make me want kids. Like now. Adorable! Is the Avacado taste very strong? My boys won’t touch the things and there’s nothing I like more than hiding something healthy in a treat! I used to love that dirt pudding dessert is a kid. Your version is so much healthier and looks like a lot of fun to eat! I think I should try the avocado pudding…it is just hard to believe! We make avocado pudding at least once a week. Meghan can’t get enough of it! I use dates to sweeten it instead of agave. I love your presentation–so cute! This is adorabe and M is even more adorable! It looks like she LOVES it 🙂 I used to have the “unhealthy” version of this all the time as a kid. I can’t wait to try it with the good stuff. Avocado pudding? I’ve had it as ice cream and loved it, so need to try it as pudding. How cute! I love avocado in sweet treats.